The all-American Cadillac ATS is about as good as modern sport sedans get. Now it's got a version designed to fight off its two-door competitors as well. 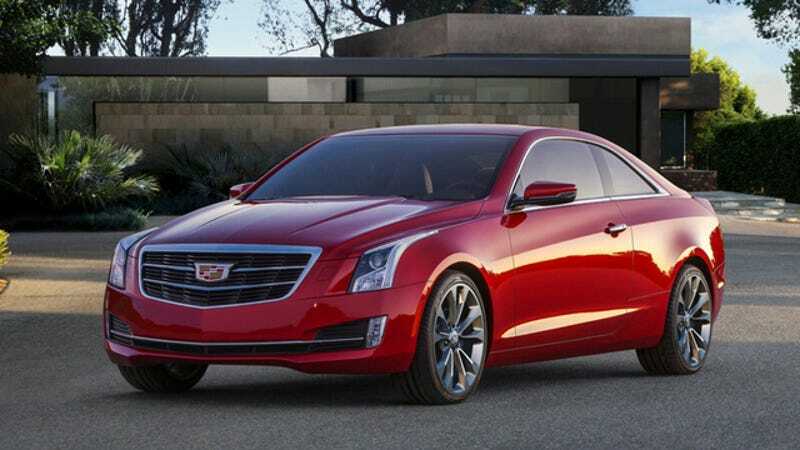 Meet the Cadillac ATS Coupe! The first official shots of the ATS Coupe dropped around midnight tonight. Interestingly, it's not as sharp and extreme as the previous CTS Coupe or even the Cadillac ELR; instead, Cadillac's designers took a cleaner, more conservative approach. It does, however, feature a preview of Cadillac's new crest, which we've seen on the Cadillac Elmiraj concept car. I think it's a nice evolution of that design. But it looks really good, and also distinctive in its own way too. It's got a different enough identity from the CTS Coupe, plus it's very clearly a Cadillac. Buyers can opt for either the 2.0-liter turbo four or the throaty 3.6-liter V6. The sedan's base 2.5-liter four is a no-go on the coupe, but nobody will miss that. A six-speed manual is also available on the turbo four, which is nice. What's not to love when you combine two-door sexiness with the ATS' phenomenal Magnetic Ride Control handling and engine choices? Expect to see more when it gets revealed live tomorrow morning at the Detroit Auto Show.